With locations in Lynchburg, Appomatox, Bedford and Altavista, Joe Beans is brewing home taste across the region. 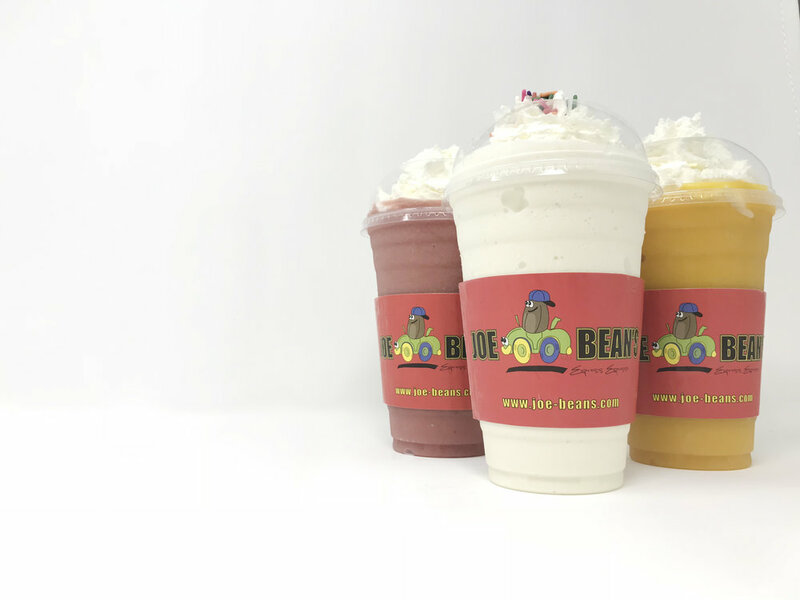 Joe Bean's Express Espresso is a drive-thru in Lynchburg, Virginia that serves brewed coffee, specialty coffee drinks, fruit smoothies, and other beverages and baked items. Since 2000, Joe Bean's has offered Lynchburg a fine product with excellent customer service. Head to head, Joe Beans has been a local favorite for more than 10 years, as mentioned in Lynchburg Living Magazine. Tall 12 oz. / Grande 16 oz. / Venti 20 oz. Try our very own medium to dark, full-bodied roast that is our trademark. Certified Organic, Fair Trade, and just plain good. Almond, Amaretto, Apple, Banana, Butterscotch, Caramel, Cinnamon, Cherry, Coconut, Coffee Royale, Dark Chocolate, English Toffee, French Vanilla, Gingerbread, Green Mint, Hazelnut, Irish Cream, Lavender, Macadamia Nut, Maple Spice, Orange, Peach, Peppermint, Pineapple, Pomegranate, Pumpkin Spice, Raspberry, Rum, Salted Caramel, Sarsaparilla, Snickerdoodle, Strawberry, Toasted Marshmallow, Watermelon and White Chocolate. SUGAR FREE FLAVORS Almond, Caramel, Coconut, Coffee Royale, Dark Chocolate, English Toffee, Hazelnut, Irish Cream, Peppermint, Pumpkin Spice, Raspberry, Rum, Strawberry, Vanilla, and White Chocolate. *Add any of our Syrup flavors to any drink for 60¢. BEANS ~ Short bag 8 oz. Bag of Coffee, whole bean or ground. BEANS ~ Grande bag 16 oz. Most of our drinks can be made hot, iced (poured over ice) or frozen ( blended with ice in a blender). Simply request when you order. Joe Beans accepts cash and major credit cards. We have a variety of delicious fresh baked breakfast items. Ask our Baristas for the current selection. Wholesome bran with carrots, fruits and nuts. Also a featured muffin (ask Barista - Prices may vary.